My first encounter with a starling taking-up residence on my shoulder was memorable. It began with gum-like starling poop in my hair. Lyanda apologized and let me know that Carmen was a little nervous around strangers. I understood. I had fallen in love with Carmen through Lyanda Lynn Haupt's newest book, Mozart's Starling, published by Little Brown. However, meeting this wild bird in Lyanda's kitchen was a bit nerve wracking for me as well. Let me explain. I come from a Boston suburb and was raised by parents who couldn't tell a hummingbird from a goldfinch. However, moving to Seattle changed that. Seattle is a city of bird lovers where every house comes equipped with a bird feeder (okay, mine did). And this book, this book made me a bird lover for life. 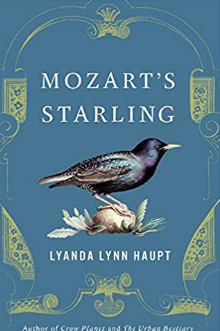 If you read one non-fiction book this year, you need to give yourself the true pleasure of Mozart's Starling by Lynada Lynn Haupt. And if you're still a tiny bit skeptical of bird books, Nancy Pearl listed Mozart's Starling as one of her top 7 picks on her recent NPR gig. I first heard Lyanda Lynn Haupt at WordsWest Reading Series in West Seattle where she read pages from her (then) yet-to-be published book, Mozart's Starling. I was immediately blown away. Here is a prose writer who writes sentences as beautiful as those of any poet. And just last week, Mozart's Starling was nominated for the Washington State Book Award. The results don't come out for a few months but the winner in non-fiction is super clear to me. 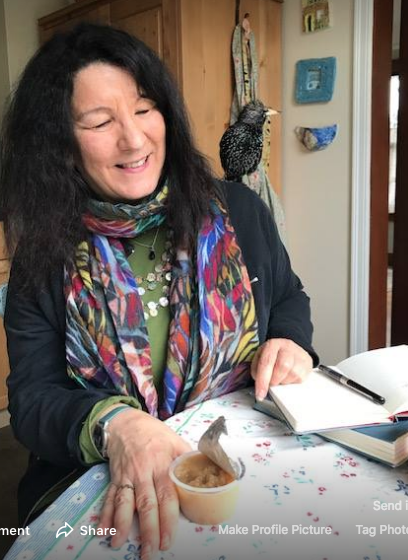 Here was a writer who wrote prose sounded like an epic poem Her story of rescuing (stealing) a wild starling and making it (Carmine) a member of her family amazed me. Here was a story for grown-ups that read like a child's adventure tale. I couldn't wait for the book to be published. This might be a good time to say that I am not normally drawn to non-fiction books, nor am I an avid birder. And yet, during this year of reading, I have enjoyed no other book as much as I've enjoyed this one. SR: Of all the prose writers I've read, it is your work that strikes me as the most like poetry. I think it has something to do with the way you juxtapose the very personal, from working in the kitchen with your dad, with the larger world as in deconstructing the universal theory of language. Do you read poetry? Are you trying for that lyric movement? LLH: Thank you! I think you know what a wanna-be poet I am. I do read poetry. I read whatever happens across my plate. I read Dickinson and Whitman. I read Kay Ryan, Sharon Olds, Denise Levertov, W.S. Merwin. Lately, I've been reading the poetry of Jim Harrison because he was very interested in consciousness, in birds, and in philosophy. I read more poetry than a normal person. And I love the Two Sylvias Poet Tarot because when I come across a poet that I don't know very much about I can look them up there. I give copies as gifts to my writer friends, poets or not. SR: What was the inception story for Mozart's Starling? Were you looking for a project that combined your passions for music and the natural world? LLH: No, I was not looking for a project to do with music or starlings. Especially not starlings. I was actually writing my previous book and I looked out on the parking strip at a bunch of starlings and I knocked on the window to get them to go away. And when they rose they were so iridescent and rainbow-like that I thought to myself, damn it. I know as a conservationist and nature writer that starlings are the number one most hated bird in the country. But they are also super pretty. And in that moment I thought of the story of Mozart and his starling. It was a kind of a funny moment; this is an Alice in Wonderland kind of rabbit hole idea. The connection between a sublime Western composer and a hated species of bird could lead to so many places. I didn't think it would lead to Noam Chomsky and the field of linguistics (one of the paths I discovered ) but I did hope it would take me to Vienna and Salzburg. I thought of intertwined bird and human voices and our thoughts on animal consciousness; this came to me in a kind of a rush. Then I thought to myself, but doesn't everyone already know about Mozart and his starling? It's kind of old news. Luckily, my husband happened to be home and having a work retreat at the house. Downstairs there was Tom and a team of six of his team members from the NGO where he works. They are smart people. I thought, I'll just go down and see if they know about Mozart's starling. It will be my sample group. So I was in one of those whirlwind of inspirations that you don't always get. I dashed down the stairs and I ran into the room. And there was just silence. Everyone looked at me and my husband looked at me really awkwardly as if to say, honey, what are you doing? What I'd forgotten was that in my glamorous stay-at-home writer life, I was still wearing pajamas. I had not combed my hair. I was like Rochester's crazy wife in the attic. I don't think they even knew I existed. So I asked my question. And nothing. Finally one really nice woman said, "my dad's really into music history, I will ask him." So I went back upstairs with my answer and made a point to get dressed, brush my hair, and then come downstairs again so that the group could see that Tom's wife was not crazy. That's how it started. I was still working on my other book but I immediately started making notes. SR: I love the breadth of your interests---from Chomsky's Universal Theory of Language to Pythagoras to Mozart to starling poop, there are so many separate threads in this book that you weave together and make seem seamless. How do you do it? Is that a problem you gave yourself to solve? LLH: Thank you and thank you for noticing. People who aren't writers might not look for that or notice it. It was actually really, really hard. Super hard. It took a lot of intention. SR: I'm glad to hear you say that! LLH: I looked back at my early notes and I'd written that I wanted to weave this story so it's tightly woven like a nest. Like a weaver finch. I love the weaver finches because they have crazy things dangling out from their nests but the nests themselves are tightly woven. I don't think I can tell you how I did it. It took lots of trial and error. Not just back and forth on my own process but also with my editor and my copy editor. I'm thinking of the chapter where I'm at the hotel in Vienna and I'm trying to layer on Mozart's historical time, his relationship to the starling, my current curiosity and my trip. I'm thinking about all the things that might have occurred or things that have not occurred. And I'm dealing with it in all these different time periods and frames. When I wrote the chapter I used different tenses. The Mozart part I wrote in the past and my current curiosity in the present. I let myself go with it even though that's a little unorthodox. Later, when the book was finished, my copy editor said, "I get it but I really think you need to choose. Tell me which one you want (past or present) and I'll fix it." That was very nice. So I tried it in my mind both ways and I consulted her and my editor. And finally I said, "I don't want to do it. Let's keep it fluid." I don't mind pressing into a little bit of unorthodoxy once in awhile. SR: I love how you include so many of your hopes for the book that didn't come to pass. The Noam Chomsky postcard episode and Carmen's mimicry (or not) of Mozart's music. I was really enamored with the details that never actually take place. Why did you include these? LLH: I was writing about a subject that involved creativity. One of the threads that most reviewers didn't pick-up on is, what is the source of inspiration? And that's a messy path. I didn't want to mislead readers. And at the end, I exhort people to follow their own gifts as a form of art and creativity in the world. It would have felt disingenuous to make it seem like it had been a simple path. It was complicated, as I've said. Lots of dead ends. Lots of things that didn't go as I expected. I think sharing those moments made it more human and it made it more true. SR: It also made it more meta. It's as if you're addressing the reader. This is what you think might happen, this is how things could have ended...You let us in on the creative process. LLH: Right. And some of it is just funny. Carmen just wouldn't learn and Mozart's grave is not what you think it is. The moral coil is fraught. SR: Well, the next question is specifically about humor. One of the many great surprises of the book is how incredibly funny it is. I've never laughed so much while reading a book. Never. There's the expected humorous situation of trying to write with a bird on the keyboard, the sounds of the coffee grinder, and also the intricacies of starling poop. Were you intentionally trying to be funny? LLH: I tried to write with good humor. In part because of the kinds of subjects that I write about. I'm often writing about the modern ecological reality which is dire. Despair evoking. I read some good nature writers whom I admire, and yet I often want to pull out my hair from boredom! So much earnestness and holier-than-thou ness. I feel we will be more successful in our efforts if we bring some good humor. I love that people laugh when they read the book. So this is what it was like writing the book. See how she's looking. She'll inspect your pen, she will poke at your pages. Oh, now she's gaping in your hair. It's so ingrained in her to search this way. LLH: Ethology is coming back into vogue as we more and more accept animal consciousness. But there's this gap from the 1940's onwards beginning with B.F. Skinner where animal consciousness was not a topic for scientific discourse because it wasn't quantifiable. It's finally come back to something we can talk about. I say 'come back" because you know Darwin discussed animal consciousness. SR: Universal Harmony, sound that links the plants together was a new idea to me. You write that this is not unique to Western culture. Do you think that listening to Carmen's sounds daily has changed your way of listening? On a larger scale, how does living with a wild thing affect you? We live in a listening world. LLH: It affects the way I walk out the door. I realize that every animal I will encounter is listening in its own unique way. I know I'm entering a listening world. I'd never dreamt of all that was going on with starling communication. What's going on with everyone else? It makes me more aware of what I say and how I say it. We're learning now that trees respond to our voices. For example, when I'm walking outdoors I try to, more than I did before, I try to mind my attention with a sense of calm, a sense of kindness. I know that sounds weird. I'm more aware of my intention because I know my intention is being received. It matters. I think it was Gary Snyder who was asked how to interact with animals and his response was, "always be polite." SR What has stayed with you the most from this book? What are you most proud of? LLH: More people have written to me after reading this book than my other books. They say they will never look at starlings the same way again. But what I think what I'm most proud of is that bringing together all the different threads of this story together. I wrote several drafts of this book and worked really hard to get to the finished product. Also, as a writer, and as a family, I'm proud that we were able to get beyond our preconceived notions of what it would mean to live with a wild animal. I had a set of expectations or anecdotes that I thought she would provide me with. But the other things that happened were surprises: her capacity for communication, her intelligence and the new things I had never known about starlings before and could have missed if we hadn't paid radical attention to what she had to say. Finally, I was grateful for what you said about the poetic language of my work. One of my goals as a writer is to bring a different kind of language to a subject that doesn't usually receive literary or a beautiful kind of language. A language it doesn't often get. But deserves. Read more about Carmen and Mozart's Starling right here on another NPR piece. To learn more about Lyanda Lynn Haupt you can check out her website. Or simply just order her book from your favorite local bookseller.